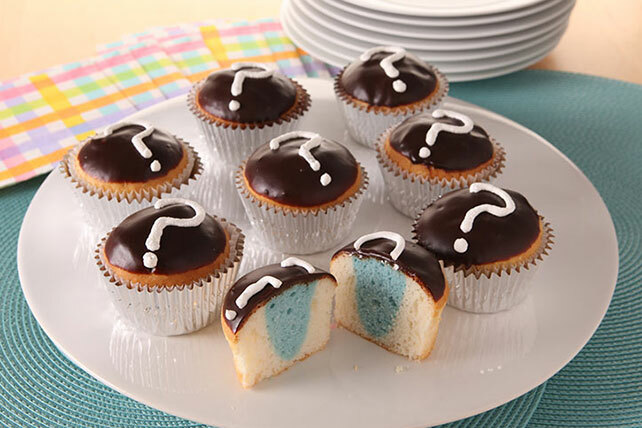 Make sharing your big news extra sweet with these adorable gender-reveal Blue Baby Cakes. Your loved ones will be so happy for you — and so glad you made these colorful Blue Baby Cakes. Reserve 1/2 cup COOL WHIP; refrigerate until ready to use. Return remaining COOL WHIP to freezer. Prepare cake batter as directed on package. Remove 1 cup batter; tint with food coloring. Spoon 1 Tbsp. untinted batter into each of 24 paper-lined muffin cups; top each with 2 tsp. colored batter. Cover with remaining untinted batter. Bake as directed on package for cupcakes. Cool in pans 10 min. ; remove to wire racks. Cool completely. Meanwhile, microwave 2 cups frozen COOL WHIP and chocolate in microwaveable bowl on MEDIUM 2 to 2-1/2 min. or until chocolate is completely melted and mixture is well blended, stirring after each minute. Cool 30 min. Frost cupcakes with chocolate mixture. Spoon reserved (thawed) COOL WHIP into small resealable plastic bag. Snip off tiny piece from one bottom corner of bag; use to pipe COOL WHIP into question marks on tops of cupcakes. These adorable cupcakes would make the perfect addition to any baby shower.